Former Milan and Lazio manager Alberto Zaccheroni is in talks with Premiership clubs about a possible role in England. Zaccheroni, who won the Serie A title with Milan in 1999, made his name with Udinese before also coaching Lazio. 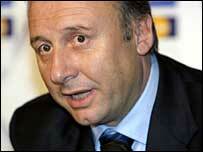 Zaccheroni told BBC Sport: "Yes, there has been contact but I do not think it is fair to talk about with whom. "I would bring the experience of having managed at the top of Serie A in Italy - and as a manager I always get the best out of the players I coach." Zaccheroni is a two-time winner of the Golden Bench, the Serie A manager of the year award, but he is currently looking for a job. And he believes that he has the potential to improve on the Premiership records of previous Italian managers Claudio Ranieri and Gianluca Vialli, who both managed Chelsea. He said: "I think that the successful managers like Arsene Wenger, Rafael Benitez and Jose Mourinho came to the Premiership after having managed at the top in France, Spain and Portugal. "I like the fair play of English players, their enthusiasm and the fact that the players always give everything. I also love the passion of the supporters." Zaccheroni reserved particular praise for Liverpool captain Steven Gerrard. He added: "I also like Rooney, Lampard and Terry but Gerrard is my favourite. "Gerrard is so versatile. He is a player who makes the difference."